Cherry Coke Zero, brought back from the U.S. Like regular Coke Zero, but even more awesome. There have been far too many stupid Coca-Cola flavour sideshows in the past decade: Diet Coke with Lemon, Diet Coke with Lime, Vanilla Coke … yeesh. What’s been sorely lacking north of the border is the one variant Coca-Cola flavour that’s been around for ages: Cherry Coke. In fact, I can think of only one Coca-Cola flavour I’d rather see: A combination of Cherry Coke and Coke Zero. And lo and behold, there it was, in a Seattle convenience store, staring back at me from the glassed-in soft-drink cooler, evidence that a right-thinking executive at the Coca-Cola Company had tapped into my dreams. It tastes exactly how you’d expect it to taste, like Cherry Coke mixed with Coke Zero. 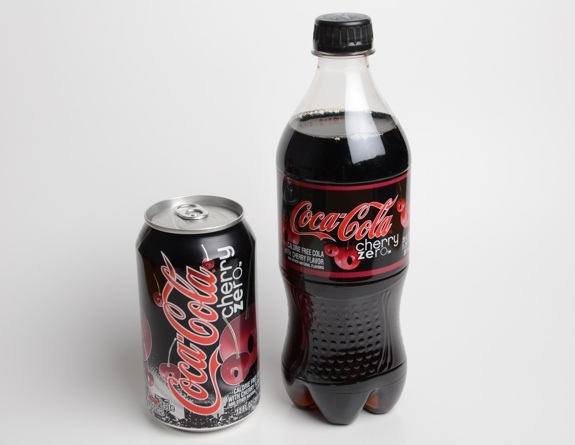 It isn’t as thick as Cherry Coke, and it doesn’t have the same mouth-filling sweetness, but it does have the same level and type of cherry flavour. Side by side, Cherry Coke Zero is remarkably close to the regular version. So please, Coca-Cola, I beg of you — make this available in Canada. The 12-pack I brought back from the States is going to vanish pretty quickly. Cost: About the same as regular Coke Zero. Value for cash money: Par for the course. Nutrition? : Zero calories. Anything else of nutritional significance is strictly accidental. Secret NEAROF! Tip: If you’re in Edmonton, Alberta, you CAN get regular Cherry Coke. Hub Cigar carries cans imported from the U.K. Each can will run you just over $2. If this was available here,my life would be complete. I love Cherry Coke, so guiltless cherry coke would be heaven.